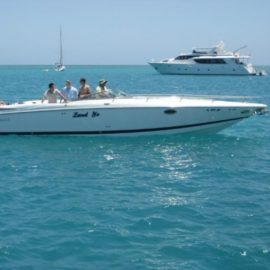 I have a gorgeous, very well maintained 1986 Cobalt 21 BR in super nice condition! This boat runs well w 260HP Mercruiser 350 I/O. Has 450 hours on the original engine. Fresh water use only on local lake. Nice bimini top in great condition hardly used. Mooring cover is perfect only a few years old .It is easy to take on and off with snaps and ties. This Big Beauty comes with 2 props, 1 is stainless steel, also dual batteries. Everything you need to go boating. This boat has been stored indoors its whole life. It has been winterized and summerized every year. I have all original paperwork including the manual. Comes with Cobalt Custom Tandem Trailer with new surge brakes and new tires. This boat needs nothing, she is ready for the 2014 boating season! 8,200 or Best Offer. 1996 Cobalt 220 For Sale – SOLD!